Fifteen years ago, Lainey O'Toole made a split-second decision, but she couldn't have known then that her choice would impact so many. Now in her mid-twenties, she is poised to go to culinary school when her car breaks down in Stoney Ridge, the very Amish town in which her long-reaching decision was made, forcing her to face the shadowed past. 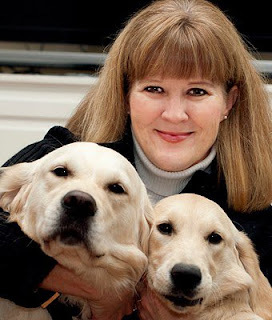 In no particular order, Suzanne Woods Fisher is a wife, mother, writer, lifelong student of the Bible, raiser of puppies for Guide Dogs for the Blind, a gardener and a cook...the latter two with sporadic results. Undaunted...Suzanne found a small royalty publisher for that book and wrote three more (all earned multiple awards). With help from an agent, she now has numerous books under contract with Revell. Also look for Suzanne's Amish non-fiction, Amish Peace: Simple Wisdom for a Complicated World, a non-fiction book of stories and examples about the Old Order Amish, as well as Amish Proverbs, and coming in Spring of 2011, look for Amish Values for Your Family. The Choice and The Waiting are the previous books in the Lancaster County Secrets Collection. 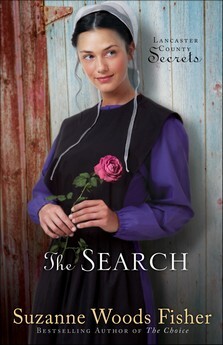 Suzanne Woods Fisher's latest installment of the Lancaster County Secrets, The Search, is just out and to celebrate Suzanne is hosting The Search iPad Giveaway! Join Suzanne for the Everything is Coming Up Roses Facebook Party on February 3rd! She’ll be announcing the winner of the The Search iPad Giveaway, hosting a book club discussion of The Search, giving away copies of all three books and HEAPS of other reader prizes! (Including roses delivered to your door for three months for you AND a friend!) Be sure to join us on Thursday, February 3rd at 5pm PST (6pm MST, 7pm CST, 8pm EST) at Suzanne’s Author Page. I really enjoyed reading The Search. The plot hooked me right from the first page, and I couldn't wait to find out what happens to each of the main characters. Each main character has his/her own plot line, but those plots are so delicately interwoven with one another, that by the end of the book it's all unified into one. The plot twists kept me on the edge of my seat, and I became deeply attached to each character and hoped for their happy endings. This is one book I had a lot of trouble putting down! I also learned so much about Amish life just from reading the book. I went to college in rural Pennsylvania for one year and there were Amish living in the area, but I didn't really have anything to do with them. I used to think it was really cool seeing a few of them in Wal-Mart or on a bus, but that was the most I ever saw of them. Reading this book gave me new insight into the life of the Amish and how similar they are to Ultra-Orthodox Jews (in terms of lifestyle, not in terms of religious beliefs). It's also refreshing to read about devoutly religious people who are entirely focused on faith in G-d, no matter what their religion. Overall: We give The Search by Suzanne Woods Fisher a 10/10! We were sent The Search through LitFuse blog tour free of charge for the sole purpose of this review; no other compensation was received. All opinions expressed are my own.